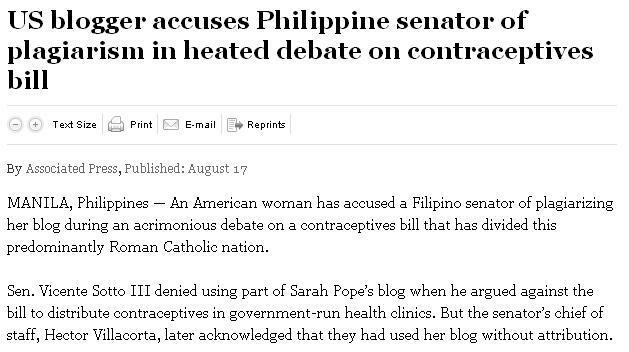 This entry was posted on Tuesday, August 21st, 2012 at 6:02 pm	and tagged with plagiarism in UP Diliman, Reproductive Health Bill, Tito Sotto and Esperanza Cabral, Tito Sotto and Natasha Campbell-McBride, Tito Sotto and Sarah Pope, Tito Sotto plagiarism, winnie castelo anti-plagiarism bill and posted in commentary, journalism, philippines, women's rights. You can follow any responses to this entry through the RSS 2.0 feed. 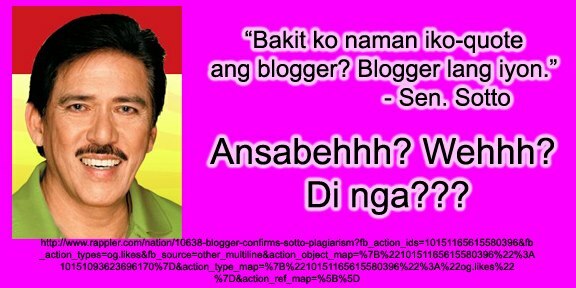 Being a senator he should at least show some form of integrity and wisdom. Unfortunately he seems to so proud that he feels is omnipotent and can challenge anybody by his humbug response to those who criticized him. He digs deeper into his own grave of oblivion by even challenging those he has already slighted. What a presumptuous gadfly.